my little red suitcase: the crafty clogs are turning.....! the crafty clogs are turning.....! 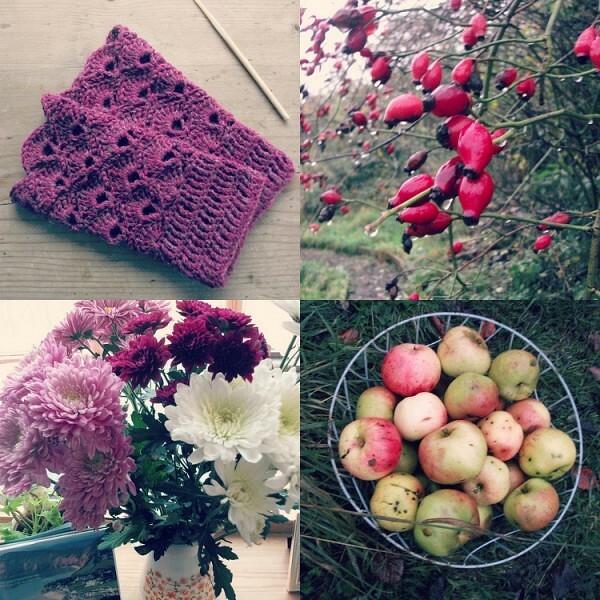 This autumn I have found myself called by the beautiful berries, the reds and the pinks, in fact I would say that this has been the year of the berries for me. I have almost never noticed quite how beautiful they are before. 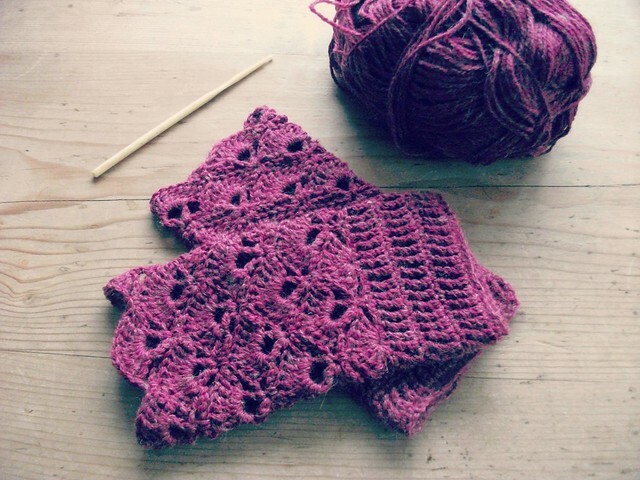 The wool I used for these wrist warmers was found tucked away in a basket in my slightly muddled local wool shop. There was no label, but the colour jumped right out at me as something I've been wanting to work with! A gorgeous deep berry colour, so lovely to work at this time of year. What would you call this colour? it was this very particular colour that I was looking for. It's not quite burgundy, or wine, or berry! Any ideas. Of course one thing led to another. and another! each time I had to add a little of this wonderful colour in. There was a moment of dismay when I realized I had made two different pairs of two different lengths with the colours in different places. Which led to some unpicking and re-making. 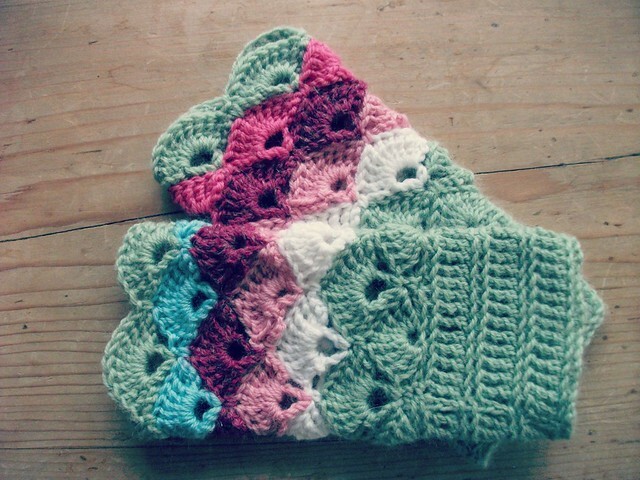 And now I am left with two gloves of the same length and different colours. I know it's confusing isn't it! So what do I do now?! I do actually really like both! I was inspired by the work of the lovely Coco rose on her post here. And also Maiike's beautiful design at Crejjtion. The pattern is here. It would be sweet to add some little roses to the berry gloves. I used approximately a 3.5 hook, which you can see above. I love this hook. I think it's very old as it belonged to my grandma. I think it may be made from bone! It's got a great little hook on the end and really easy to use. I have to say a couple of years ago when I began crocheting granny squares, I never ever thought I would see the day when I would understand how to make these. But I do now, and that's just fab and very empowering, and really rather amazing! and now I'm thinking hmmm, how about some berry boot toppers to match, oh yeah! I agree. Why should everything match. 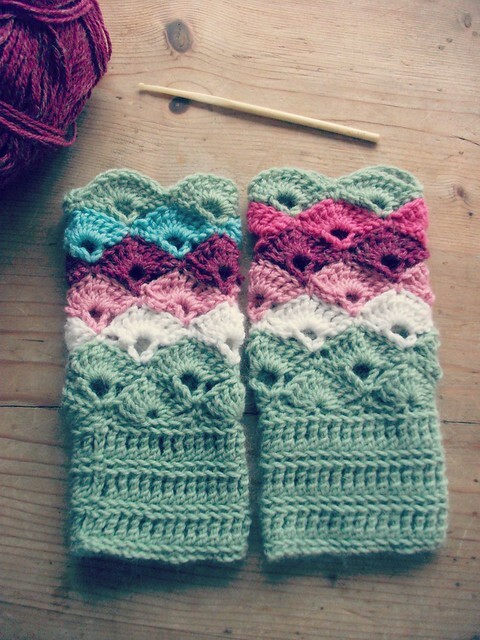 I love your wristwarmers and think a pair of boot toppers would be great. I think that is a bone hook too. I am so glad crochet is giving you so much pleasure. I does me too! 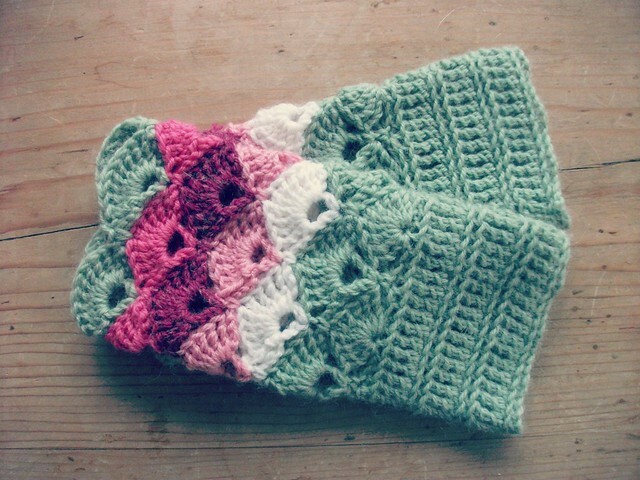 Gosh Heather, your wrist warmers are stunning!!! It's a pity I cannot wear this kind of stuff here in JK!I love the idea of a pair of mis-matched boot toppers!!!! As you said : yay!!!! Beautiful color(s). I think they're really pretty. They got something sweet and comfy to them. They are adorable! I especially love the colours - very pretty! Love these! So stylish and practical, i would call it mulberry . . . .